Synthetic peptide conjugated to KLH derived from within residues 150 - 250 of Mouse GluR2 . Our Abpromise guarantee covers the use of ab20673 in the following tested applications. WB Use a concentration of 3 - 10 µg/ml. Detects a band of approximately 99 kDa (predicted molecular weight: 99 kDa).Can be blocked with Mouse Ionotropic Glutamate receptor 2 peptide (ab25708). Additional bands: The band observed at ~50KDa is consistent with the predicted size of Gria2 protein, for which GluR2 is the precursor. We are unsure as to the identity of the band at ~43KDa. Additional bands at: 43 kDa. We are unsure as to the identity of these extra bands. The band observed at 50KDa is consistent with the predicted size of Gria2 protein, for which GluR2 is the precursor. Immunohistochemistical detection of Ionotropic Glutamate receptor 2 using antibody (ab20673) on PFA perfusion-fixed frozen rat brain sections. Primary antibody was used at 1/300, incubated for 18 hours @ 20°C in PBS + 0.3 % Triton X100. Secondary Antibody: Goat anti-rabbit Alexa Fluor® 488 (1/1000). 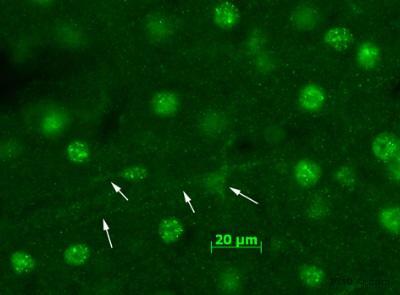 The image demonstrates immunostaining obtained in the rat cortex, thin and punctuated cytoplasmic staining is observed as previously described for the hippocampus (J neurosci 2003 Nov 1923(33):10521-30). There is some staining in cellular processes as well (arrows). Publishing research using ab20673? Please let us know so that we can cite the reference in this datasheet. Could you please let us know what concentration to expect for Product ab20673? We have received lot GR636101 on 2 separate occasions, and both times we received 100 ul with the concentration listed as 1 mg/ml, both on the label and the product datasheet. Your website for the product indicates ab20673 is supplied at 0.5 mg/ml. Has there been a change to the product? Please let me know so that we can update our corresponding datasheet accordingly. Thanks! Hello and thank you for contacting us. Yes, the concentration of ab20673 is 1.0 mg/ml and we will update our website. Please let me know if you have further questions. I would like fast answers for ab20673 (anti-GRIA2 or GluR2 antibody) and ab25708 (peptide). Have you tested on human tissue, do you have an image? Do you have other image show good membrane staining? Does the peptide work well during neutralization test? Do you have other antibody and peptide for this protein in human tissue. The ab20673has not been tested on human samples yet, but is thought to be working as the homology is high. Please let me know if you would like to test this on your own asI could offer you our AbTrial discount. Our peptides are usually designed to block the antibody. This way you can asses how specific an antibody works. We haven't performed any functional studies with it, and as it is only a very short peptide of 14AA, it is quite unlikely that it will block the channel. Unfortunately, we do not have another peptide or protein in our catalog which is suitable for this purpose. https://www.abcam.com/index.html?datasheet=87605 (or use the following: https://www.abcam.com/index.html?datasheet=87605). https://www.abcam.com/index.html?datasheet=87606 (or use the following: https://www.abcam.com/index.html?datasheet=87606). https://www.abcam.com/index.html?datasheet=101887 (or use the following: https://www.abcam.com/index.html?datasheet=101887). https://www.abcam.com/index.html?datasheet=106515 (or use the following: https://www.abcam.com/index.html?datasheet=106515). I have a question about ab20673, Ionotropic Glutamate receptor 2 antibody. What is the sequential homology between ab20673 and human GluR1 (SwissProt P42261), human GluR2 (SwissProt P42262), human GluR3 (SwissProt P42263) and human GluR4 (SwissProt P48058)? Has ab20673 tested reactivity with those human Glutamate receptors? Thanks for your enquiry. The sequence homology between the immunogen sequence of ab20673 and human Glutamate receptors are as follows. human GluR1: 60% human GluR2: 92% human GluR3: 30% human GluR4: 40% Based on sequence analysis, ab20673 is most likely not reactive with other glutamate receptors (1, 3, 4). I hope this information helps you, please do not hesitate to contact us if you need any more advice or information.